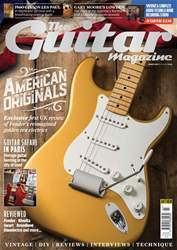 Hi TGM team, just wanted to say thanks for your fantastic feature on the 60s Flying V that was in your February issue of the mag – I love those old Gibsons, and having a chance to see such a rare and gorgeous guitar up close. Would you consider doing something similar with some of Gibson’s other ‘unusual’ designs in the future? Getting a really detailed look at an old Explorer or Firebird would be amazing!